The normal collection day for the Parish is Wednesday. All items should be at the usual collection point by 7am. Your bins are emptied on the same day every week. You need to put your bin out for collection before 7am on your collection day. It is okay to put your bin out the evening before. 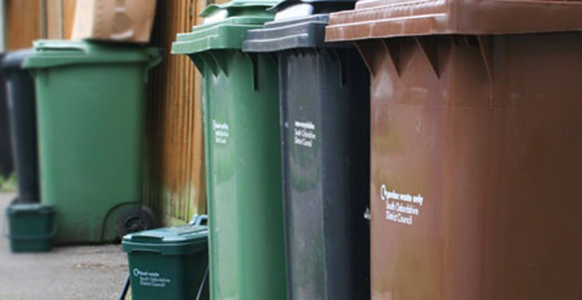 South Oxfordshire District Council offers detailed information about the rubbish collection services offered and any changes to the ‘normal’ collection dates. 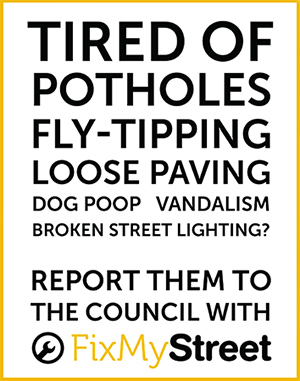 If you need to report a missed bin collection, please click here. The council cannot cannot collect window panes, glass cookware/pyrex, glasses, broken glasses, light bulbs etc. For specific information regarding light bulbs, please visit the Oxfordshire County Council A-Z website. All these can go in your bin together and should be loose (no bagged materials). It’s best if all materials are clean – this helps to keep your bin clean and reduces contamination of the recycling . If you fill your green bin you can put extra recycling out for collection next to your bin in either clear or see-through sacks, or cardboard boxes. Small electrical items – put them in a tied carrier bag next to your grey bin on your normal collection day. Broken toasters, kettles, irons, hairdryers, drills, radios, small electronic toys, telephones, power tools, straighteners, shavers, clocks and alarms. Large electrical items such as televisions, microwaves, ovens, fridges, washing machines, etc. You can get rid of large items with the Council’s bulky waste service – visit the bulky waste page to find out more. Textiles – put them in a tied carrier bag next to your green bin on your normal collection day. Duvets. Good quality or just unwanted clothes – please give these to charity. Batteries can be recycled on your recycling collection day. Just pop them in a clear plastic bag (such as a sandwich bag or food bag) on top of your green recycling bin. The council can collect household batteries, such as 6v batteries, 9v batteries (transistor batteries), D, C AA, AAA and button batteries (watch batteries) as well as mobile phone batteries, laptop batteries and lithium batteries with tape across the terminals. The council cannot collect batteries with trailing wires, car batteries, or other industrial batteries but you may be able to take these to a Household Waste Recycling Centre. Your food is collected every week. Use your small kitchen bin to collect your food scraps each day and then transfer them into the large food recycling bin which we’ll empty each week. What can I put in my food recycling bin? What cannot go in your food recycling bin? These can all go in your green recycling bin. These can all be taken to the county council waste recycling centres. The council provides a garden waste service for items such as grass cuttings, leaves, branches, weeds and hedge clippings. This is a fortnightly collection from a wheeled bin. Garden waste is collected on the same day as your recycling – to check when this is, see the council’s collections page. Please note – the Council is not able to not collect extra garden waste that is left in in rubble sacks or tonnage bags.